+Derik Lattig says check out this job listing! 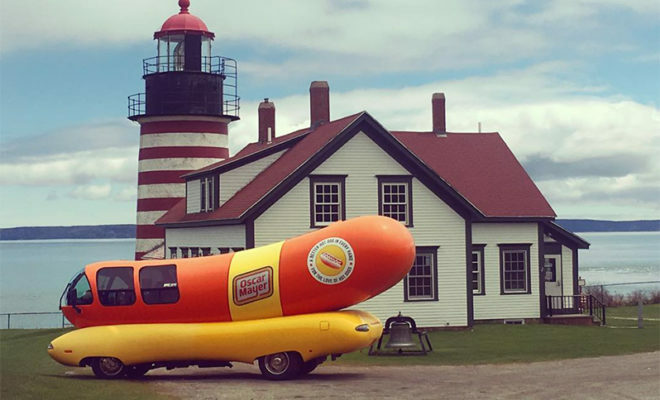 If you can be an enthusiastic brand ambassador, present yourself well at events and TV appearances, and handle driving a 27-foot hot dog across the United States, you should apply to become an official “hotdogger” for Oscar Mayer! Even though the PDF application says that the job posting is only open through January 31st for a year contract, news stations like the Houston Chronicle say that the application is back open for future hotdoggers. CNBC says that snagging the odd job is extremely difficult due to the high number of applicants (over 1,200 last year) and the caliber of driver/spokesperson the company is looking for. “In an effort to stick out, I went to the post office and I actually got a rectangular prism-shaped box and I decorated it like a giant hot dog. And in the letters of recommendation from my bosses, I asked them to fill them out with hot dog puns,” hotdogger Isaac said. Each hotdogger takes a special driving course to learn how to maneuver their way across the country in one of the $400,000 Wienermobiles. The first Wienermobile was made in 1936, and since then, there have been 11 versions of the design making Americans smile and successfully marketing the company.